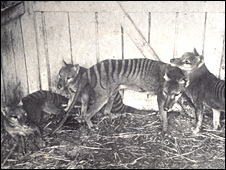 A fragment of DNA from the Tasmanian tiger has been brought back to life. Australian scientists extracted genetic material from a 100-year-old museum specimen, and put it into a mouse embryo to study how it worked. It is the first time DNA of an extinct species has been used in this way, says a University of Melbourne team. The study, published online by the Public Library of Science (PLoS), suggests the marsupial's genetic biodiversity may not be lost. Dr Andrew Pask, of the Department of Zoology, who led the research, said it was the first time that DNA from an extinct species had been used to carry out a function in a living organism. "As more and more species of animals become extinct, we are continuing to lose critical knowledge of gene function and its potential," he said. "Up until now we have only been able to examine gene sequences from extinct animals. This research was developed to go one step further to examine extinct gene function in a whole organism." 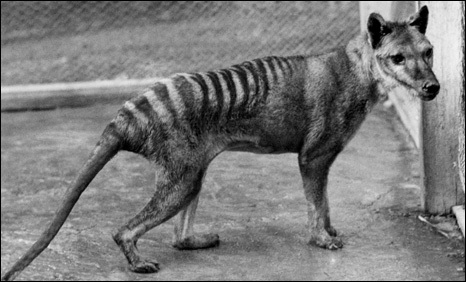 The Tasmanian tiger was hunted to extinction in the wild in the early 1900s. The last known specimen died in captivity in 1936, but several museums around the world still hold tissue samples preserved in alcohol. The University of Melbourne team extracted DNA from some of these specimens, and injected a gene involved in cartilage formation into developing mouse embryos. The DNA functioned in a similar way to the equivalent gene in mice, giving information about the genetic make-up of the extinct marsupial. "At a time when extinction rates are increasing at an alarming rate, especially of mammals, this research discovery is critical," said Professor Marilyn Renfree, also of the University of Melbourne's Department of Zoology. "For those species that have already become extinct, our method shows that access to their genetic biodiversity may not be completely lost." Prof David Rawson, who was not part of the research team, said the work gave a glimpse of an aspect of an organism that we no longer have. "We only get a glimpse; we only see a tiny part of the whole picture," he said. Prof Rawson said the DNA came from a species that only recently died out, and for which there are samples preserved in alcohol. Going further back in time will be more difficult, he added. "To go back to animals and plants that went extinct thousands of years ago, there is less chance to get a sizeable portion of DNA to unravel it," he explained. "But modern techniques are developing all the time - we can now get information from material we once thought was impossible." Some researchers think the method could help reveal the function of genes in species such as the Neanderthals or mammoths. Prof Rawson, of the LIRANS Institute of Research at the University of Bedfordshire, UK, is one of several UK experts involved in the Frozen Ark, a global project to preserve genetic information from a range of threatened species. Full details of the Australian study are published in the open-access journal PLoS One.